Congrats, babe! You did it! A round of applause for this truly momentous moment. Remember all of those sleepless nights when you first began? The feelings of fear? The moments of “I can’t do this?” The anxiety over no longer having a steady paycheck and over no longer having the stability of a 9-5 job? You feared the worst: that those who told you not to do it would be right. That you wouldn’t prove the naysayers wrong. That you’d be the girl who tried and failed. Well, I think on this day, in this moment, we can officially say that the girl who once lived in a period of self-doubt, is gone forever. That girl set out to make her dreams come true. That girl took control of her own life and didn’t take the easy way or the safe way or the boring way. That girl took the reins of her own life, even all the while knowing that her life, at least for a while, would be akin to riding a bronco at a rodeo. But you know what? She made it. You made it. Revel in your success. Drink it. Let it wash all over you. The time has come, the moment has arrived, that your business has become busy enough and successful enough that you now need to bring someone on board. Life’s crazy, huh? Just a short while ago you had a boss; now you get to be the boss. It isn’t a decision to be taken lightly. That you know, of course. You wouldn’t be here at Diary of an Entrepreneur if you didn’t. We all know this business — that is, being in the business of ourselves — is hard work. We didn’t get here without blood, sweat, and tears, and there is only one way to go: and that is up. More business. More revenue. More clients. More employees. 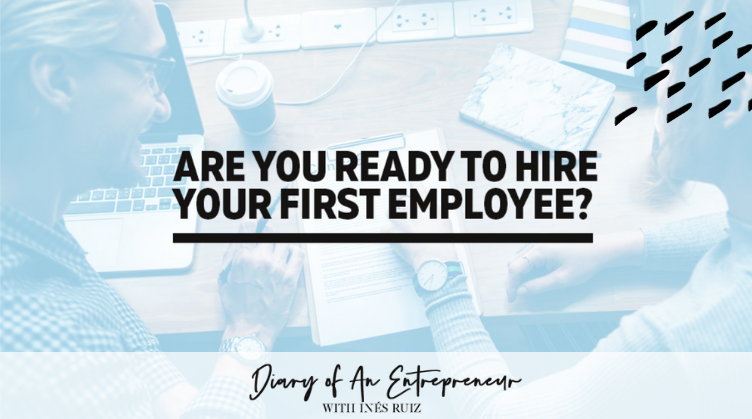 Hiring your first employee is a huge deal, and it is one of the biggest decisions you will ever make. This business, this is your baby. It’s an extension of yourself. It’s your world. The thought of allowing someone into your life in such an intimate way is nerve wracking, but you know hiring an employee is the logical next step because you need the help. There’s simply too much work and only one of you to go around. You’re burning the candle at both ends, and as you’re learning, it’s not a sustainable way to live. Start by making a list of what it is you truly need help. Rank the tasks from most important to least important. This will allow you to really now of the position that you need to hire. Perhaps you need someone to come in and manage the books and the taxes. Perhaps you need a photographer and social media guru. Perhaps you need help with responding to emails, phone calls, and business inquiries. There is no “right” first hire to make. This position is entirely based upon what YOU need as the boss. While it might feel cool (and, hey, who doesn’t love an ego stroke every now and again?) to simply hire an “assistant,” that might not necessarily be what you need. Rather than post a listing for a “jack of all trades” and then having to deal with the ensuing million responses from people who are okay at a fair number of things, post a listing for what you actually need. That way you will be on the receiving end of emails from people who have the potential to be extremely valuable to your business. Once you have decided what it is that you need, start by putting out feelers. Let your family and friends know that you’re looking to hire an employee. Will the employee be full-time or part-time? Will you offer benefits? Will the employee work out of your home? These are all things to consider. Remember that while it might seem easiest to hire the first person that seems qualified (after all, you are busy and need the help! ), the first person isn’t always the best person. Take your time. Trust your gut. This person is about to play a big part in your life, so make sure you’re choosing a good one. One that will help your business grow and who will help you grow as a boss and an entrepreneur.